One thing that surprised me about the artwork of the Resurrection: in many, many artworks, the guards play an important role in the scene! Take, for example, this picture! Resurrection of Christ, by Bartolomé Bermejo, c. 1475. Museu Nacional d’Art de Catalunya, Barcelona, Spain. An impressively detailed picture of Christ stepping out of the tomb, the soldiers are dressed in armor that looks distinctly Spanish and very ornamental… which isn’t surprising, given that the artist was Spanish! While it’s true that the three Marys coming to the tomb with perfume for anointing Christ are prominently placed in the background of the picture, it is clear that the main focus of the artist is Christ and the soldiers. 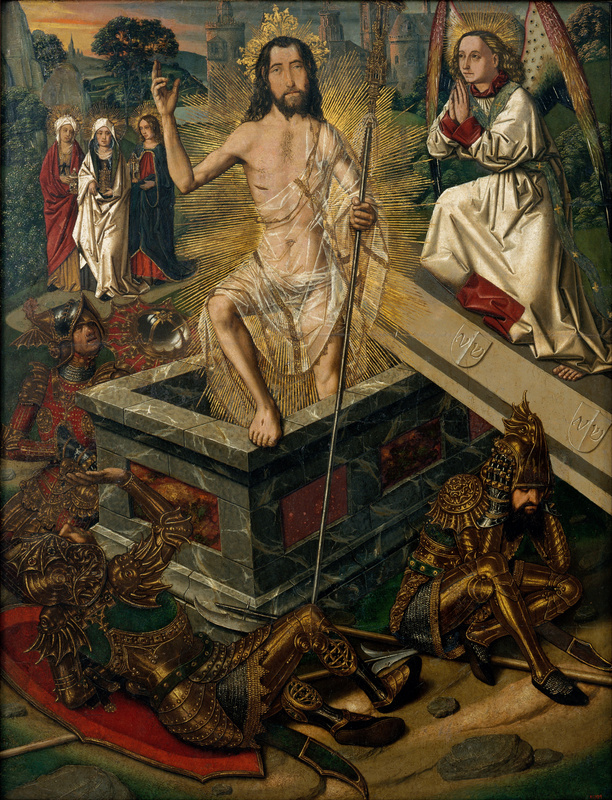 And this picture is typical of the many Western European artworks of the Resurrection! The main focus is Christ and the soldiers. If the women who arrived at the tomb first are there (which is not necessarily the case!) they are usually in the background. This amuses me because the guards actually don’t play a prominent role in the Resurrection narrative in the gospel! Instead, it’s the women that feature prominently in all four gospels. It is only in the Gospel of Matthew where the guards show up at all… and when they do, it almost feels like an afterthought! 62The next day, the one following the day of preparation, the chief priests and the Pharisees gathered before Pilate 63 and said, “Sir, we remember that this impostor while still alive said, ‘After three days I will be raised up.’ 64Give orders, then, that the grave be secured until the third day, lest his disciples come and steal him and say to the people, ‘He has been raised from the dead.’ This last imposture would be worse than the first.” 65Pilate said to them, “The guard is yours; go secure it as best you can.” 66So they went and secured the tomb by fixing a seal to the stone and setting the guard. 1 After the sabbath, as the first day of the week was dawning, Mary Magdalene and the other Mary came to see the tomb. 2 And behold, there was a great earthquake; for an angel of the Lord descended from heaven, approached, rolled back the stone, and sat upon it. 3 His appearance was like lightning and his clothing was white as snow. 4The guards were shaken with fear of him and became like dead men. 5Then the angel said to the women in reply, “Do not be afraid! I know that you are seeking Jesus the crucified. 6 He is not here, for he has been raised just as he said. Come and see the place where he lay. 7 Then go quickly and tell his disciples, ‘He has been raised from the dead, and he is going before you to Galilee; there you will see him.’ Behold, I have told you.” 8Then they went away quickly from the tomb, fearful yet overjoyed, and ran to announce this to his disciples. 9 And behold, Jesus met them on their way and greeted them. They approached, embraced his feet, and did him homage. 10Then Jesus said to them, “Do not be afraid. Go tell my brothers to go to Galilee, and there they will see me.”11While they were going, some of the guard went into the city and told the chief priests all that had happened. 12They assembled with the elders and took counsel; then they gave a large sum of money to the soldiers, 13telling them, “You are to say, ‘His disciples came by night and stole him while we were asleep.’ 14And if this gets to the ears of the governor, we will satisfy [him] and keep you out of trouble.” 15The soldiers took the money and did as they were instructed. And this story has circulated among the Jews to the present [day]. …see what I mean? They almost seen like an afterthought! So, why does the gospel of Matthew have the details about the guards while the other gospels do not? Probably because of whom the audience was. See, each of the gospels were directed to a different audience, and Matthew’s was written for the Jews. Back in the day, immediately after Jesus’s Resurrection, it appears as if there were lots of conspiracy theories floating about for the Jewish population. After all, the way Jesus was resurrected was not the way the Jews expected… at all. And there was a lot of doubt as well. After all, they had just seen Jesus die on a cross. It was hard to believe that suddenly He was resurrected in a miraculous fashion. Not only that, but the Jews would be privy to some of the details that a foreigner would not know. Luke’s audience, which was mainly Greek, would not know or really care that there was a guard that watched over Jesus’s body because the Sanhedrin complained. After all, it appears that the guards denied that anything miraculous happened. Such a narrative would hardly be impressive and may have even caused some doubt. But the Jews? They had some additional questions! After all, they knew some of the details! Now, from the way the gospel goes, it appears that the tomb was definitely empty — that could not be denied. Otherwise, the gospels would be focusing on trying to establish a theory as to where Jesus was physically buried, instead of why the tomb was empty. It would be easy enough to say, “Oh, the tomb was empty because Jesus was thrown in a mass grave for criminals and so that’s why you can’t find His Body.” Which was actually pretty common back then! But, that’s not what happened. Instead, there seems to be a consensus that Jesus was buried in a special, particular place that the disciples could not or dared not go near… and yet something strange happened and Jesus’s body disappeared anyway. And then you have the guards. The Jews knew this detail about the guards and it was likely that they would ask, “But what about the guards? Don’t they have any testimony of this event? Shouldn’t they have seen the Resurrection?” So, they needed to have an answer! And so, Matthew stuck a brief explanation into his gospel, whereas the other writers did not… even if his explanation is a bit lame. And, in a way, that makes things make a little more sense. I’ve always wondered why the disciples were afraid to approach the tomb initially, but not the women. But, if there were guards there, the guards would probably be more concerned with the men and fight them off. But the women? History is full of stories of men underestimating women and seeing them as to weak to do anything important. So, why was it so commonly portrayed in Western European art? Probably because seeing impotent soldiers fainting on the ground, with Christ gloriously climbing out of His tomb was an image so powerful that artists just had to paint it. What can I say? Christ is glorious indeed!